Christopher “AudioCzar” Smith is no joke. The man’s been cranking out track after track for a long time, now, and in the last year he’s settled on Studio One Professional for all of his sonic endeavors. 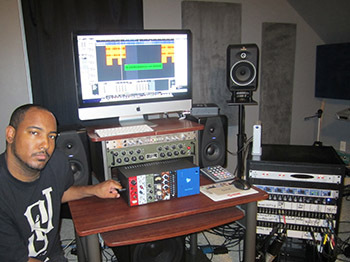 Fortunately for us (and you) I was able to get him to answer some questions about his production habits, and why he’s chosen PreSonus. When he’s not producing music, he’s also producing excellent videos full of Studio One tips; at the time of this writing he’s up to 20 and counting. Click here to see all of the Czar’s vids. I’m Christopher “Czar” Smith, originally from Memphis, but I live in Nashville, TN. I am an audio engineer specializing in recording and mixing. I bought Studio One Artist during a NAMM sale few years ago, for about $20. It was an impulse buy I’m glad I made. Actually, I remember my first recording setup back in 2000—I had a PreSonus TubePRE for vocals. Every mix I’ve done since 2013 has been done in Studio One Professional, and every song or album I’ve mastered since upgrading to Professional was also done in Studio One. When I work out of Groove Box studios here in Nashville I use the DigiMax FS for tracking drum or hardware inserts for my analog gear I bring with me. I also have a FaderPort that I use when mixing. PreSonus is great because unlike a lot of other companies, you can tell they are really passionate about their products, and they listen to the consumer. They also have excellent customer interaction. If you tweet them, they will tweet back. Everyone I’ve met from the PreSonus staff at NAMM or Gearfest have all been friendly and helpful. And all the products are well thought-out and designed. PreSonus is one of the few companies I look forward to seeing new products from every year. The last big project I did was a mix for Diane Betts, a very talented singer/songwriter here in Nashville. Her song was mixed and mastered using Studio One Profefssional. Right now I’m finishing up mixing and mastering The Equalizers debut album, “After Hours.” Next up, I’ll be mixing an album for a rap group from Nashville, and I’m doing some production for a rap artist from Nebraska. I also just got hired to do some mixing and mastering for an artist in France. It’s the first time I doing work for someone overseas, so I’m excited about it! Where can folks find out more information about you and your work online?